The aftermath of pumpkin carvings is a lot of squishy guts and these beautiful little nutritious morsels of goodness! If you can get past the pumpkin smell, the stickiness and the workload you are in for a treat! 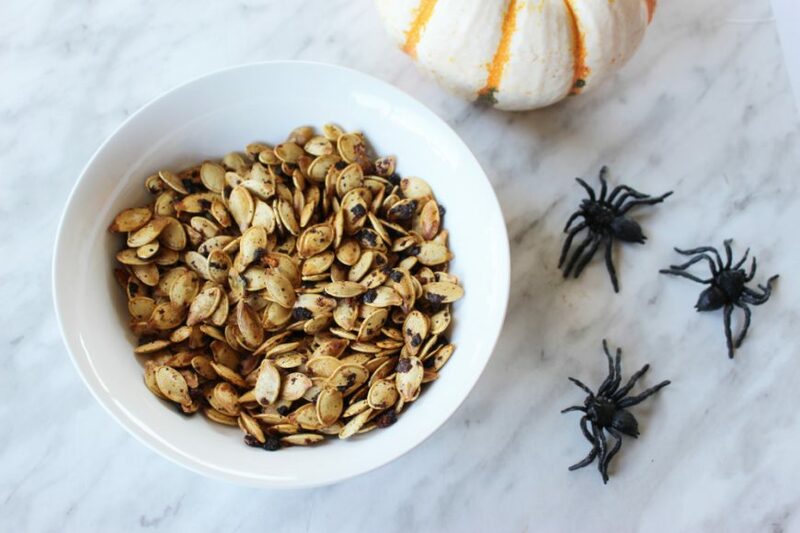 Pumpkin seeds are a treat year ’round, add them to salads, dress them up with different spices or enjoy them as is. 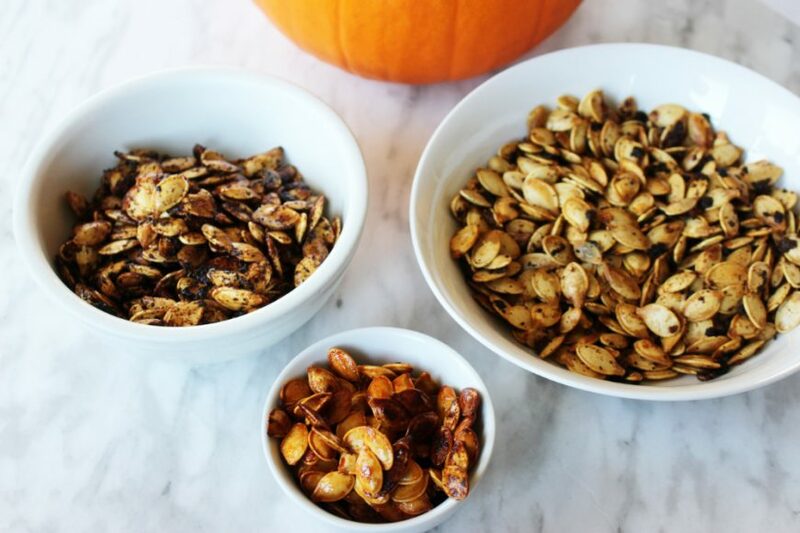 Pumpkin seeds are one of natures greatest gifts. You ready for some pumpkiny goodness? Let’s get to it! You’ve cut open the pumpkin, perhaps for Halloween or maybe to make a pumpkin pie from scratch! Let’s get real here though, it’s probably the 1st option, canned pumpkin is just too easy and for real, ain’t nobody got time for that! 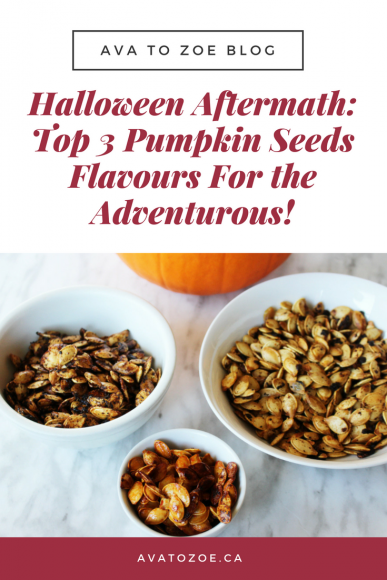 So after you’ve scooped them out you need to clean the seeds until they are free of all pumpkin guts! You can stop here or if you’re an over-achiever like me, you can boil them for 10 minutes in salt water. Reduce the heat to simmer, uncovered, for about 10 minutes over low-medium heat. You can totally skip this step but you do need to clean them up with some water! 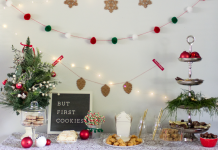 You can stop right there and enjoy or dress them up for a delicious treat! 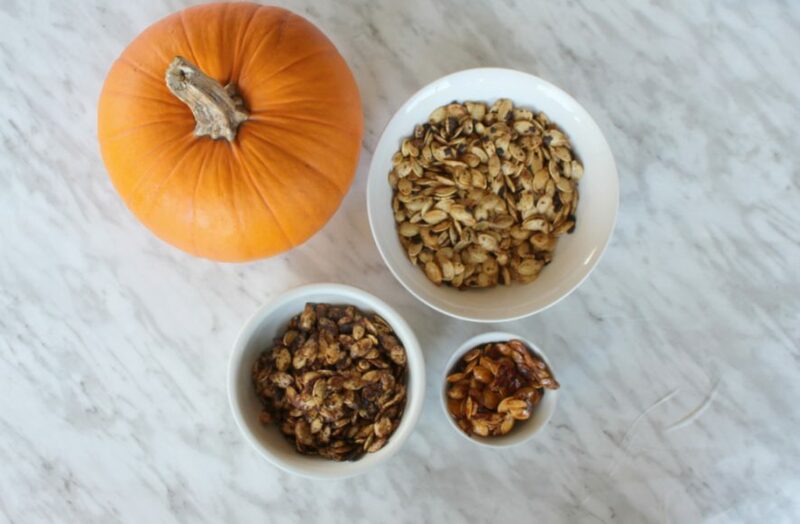 I found that one pumpkin generally yielded one cup of pumpkin seeds. 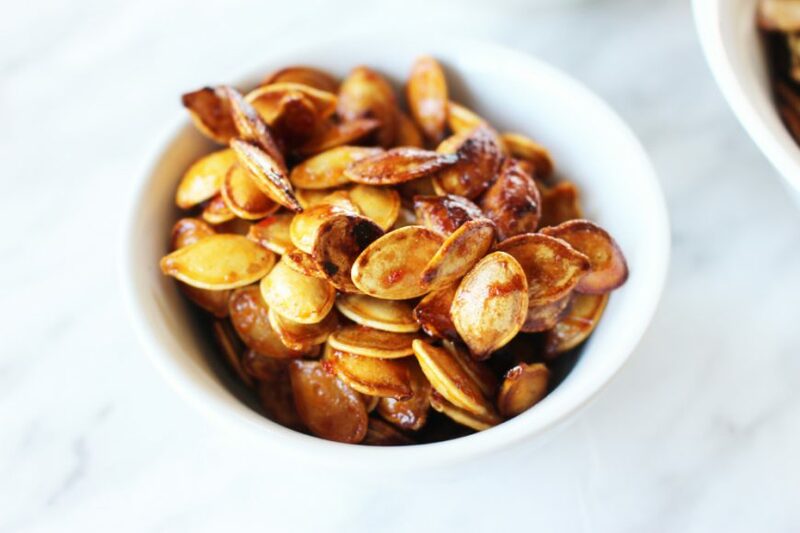 Combine 1 cup pumpkin seeds, toasted in the shell, 1 Tbsp butter, melted, ½ tsp garlic powder, 1 Tbsp parmesan, grated, ¼ tsp black pepper, return to oven for 10-15 minutes. 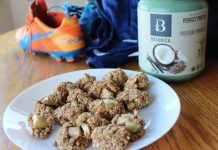 Combine, 1 tbsp Honey, 1 tbsp Sriracha, 1/4 tsp Salt, 2 drops Apple cider vinegar, 1/4 tsp Olive oil, 1 cup Pumpkin seeds, toss to coat evenly. 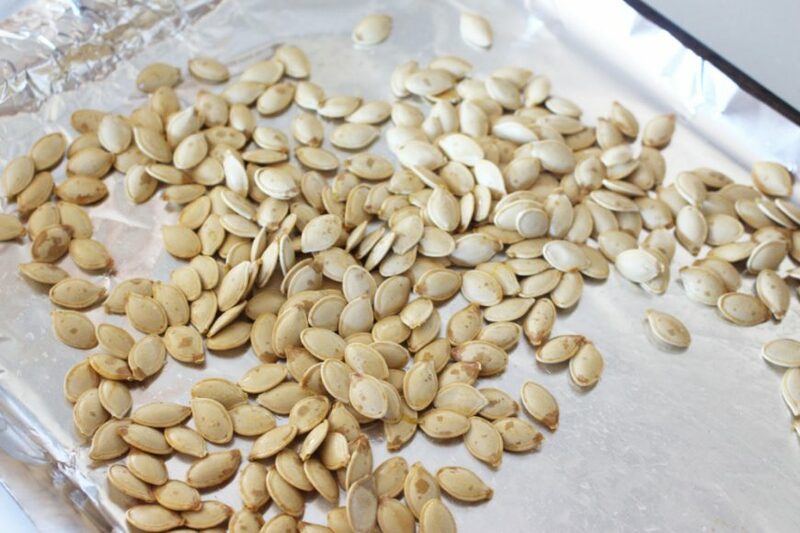 Place them on a baking sheet with parchment paper and bake for 10-15 minutes or until golden brown. They will stick together if you don’t spread them out well. Combine 2 tablespoon melted butter + 2 tbsp grated Parmesan + ½ tsp Italian seasoning, return to oven for 10-15 minutes. 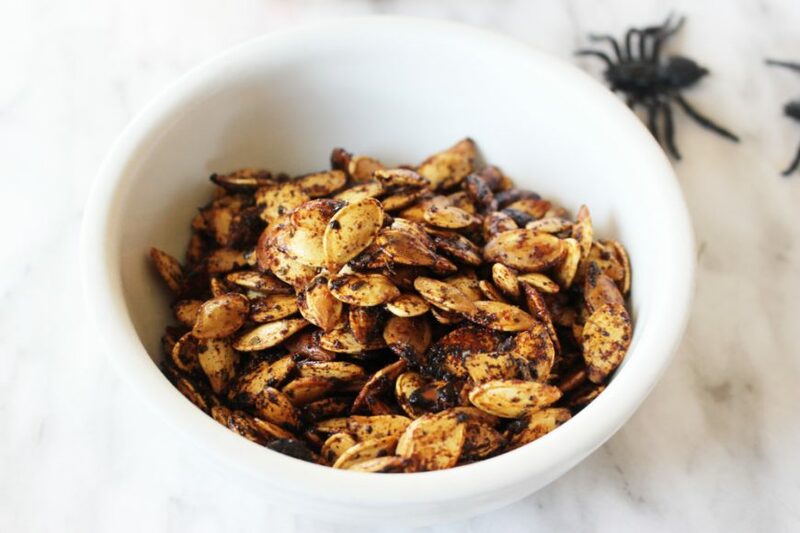 I did find that the Italian and the Garlic Parmesan Pumpkin seeds had a very similar taste but the Garlic Parmesan seeds have much more of a garlicky after taste, perfect for scaring away the vampires! The overall winner for sure was the Honey Sriracha Roasted Pumpkin Seeds. 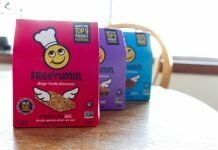 The sweet and spicy of the two flavours combined are definitely my newest treat!